Somehow I’ve managed to hit 26 without ever seeing a Spencer Tracy film. Despite being an avid viewer of classic Hollywood movies for as long as I can remember, I’ve just never come across the man in anything. To my eternal shame, I haven’t seen Bad Day At Black Rock (1955) or any of the comedies he made with Katharine Hepburn, not even Guess Who’s Coming To Dinner (1967). Although I’m familiar with his body of work and uniquely craggy features, Tracy has been a cultural blind spot with me for years that I’ve always meant to put right and never found the time for. Until today. And now I feel like a fool for denying myself the pleasure for so long. Edward Dmytryk’s oedipal succession Western Broken Lance is a relocation of Jerome Weidman’s 1941 novel I’ll Never Go There Any More by screenwriter Philip Yordan, which was previously filmed as House Of Strangers (1949) with Edward G. Robinson, also with a script by Yordan and also produced by Sol C. Siegel. It may not be a typical Tracy outing but it seemed to me to be as fine an introduction as any to this formidable old bear. 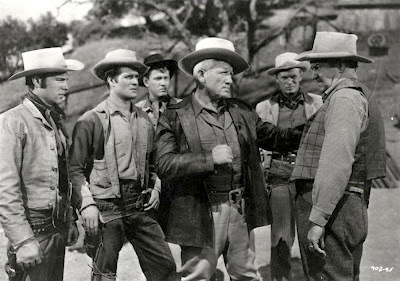 The actor commands the screen as temperamental Irish patriarch Matt Devereaux, a vivacious, bull-headed cattle rancher at odds with his grown sons, led by the eldest Ben (Richard Widmark), a deeply embittered and jealous sort who has a progressive vision for the land his father has strived to win for the family through gunpoint diplomacy and unauthorised lynchings. Ben wants to sell the grazing country to Eastern oil barons but Devereaux Senior is having none of it and thrashes his offspring for the suggestion. 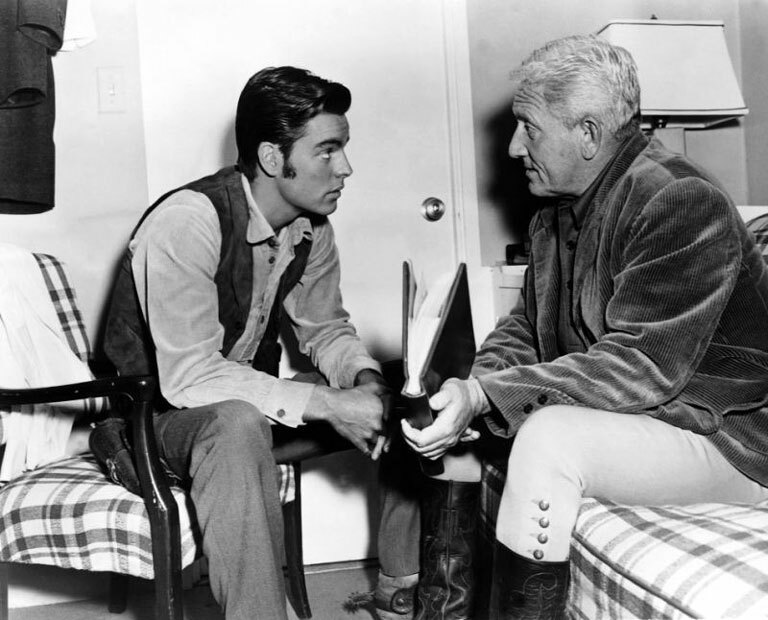 Only Matt’s youngest and favourite son Joe (Robert Wagner), the “half-breed” product of his controversial second marriage to Comanche princess Señora (Katy Jurado), remains loyal to the old man’s wishes, eventually doing time on Matt’s behalf after the latter leads a raid on a copper refinery owned by a mining company whose operations are polluting the stream were the Devereaux herd drink. When Joe emerges from prison after three years of breaking rocks, his father is dead, his mother has returned to her people and his brothers are pressing ahead with the sale as planned, offering him $10,000 to get out of town. When Joe tosses the cash contemptuously into the nearest spittoon, Ben’s ire is stoked and the siblings lock horns one final time. Tracy’s Matt Devereaux makes for a wayward father, too busy building an empire with tenacity and ruthlessness to lavish attentions on his sons and paying the price for his neglect in old age. He refuses to move with the times, resisting the spread of civilised Eastern values into a territory he helped build as a young fugitive from the Potato Famine armed with a six shooter and bull whip. Like King Lear, Devereaux must live to see the kingdom carved up between his undeserving progeny, two of whom are dullards and the other a monster (the appropriation of this same grand theme also provides a subplot for Anthony Mann’s 1955 Western, The Man From Laramie). The best among them and the true heir to his legacy is Joe, who represents hope for the future and rises above the racism he encounters from the community to win the heart of the governor’s daughter, Boston-educated society beauty Barbara (Jean Peters). Wagner’s Joe anticipates Martin Pawley in The Searchers (1956) and makes for an amusingly fifties hero – a handsome, troubled youth with elaborately combed and pomaded hair who only gets the girl when he articulates his feelings, not by impressing with brute heroics. However, his unspoken bond with his mother, played by the wonderfully sad-eyed genre regular Jurado, is extremely touching, as indeed is her love for Tracy’s Devereaux, deep and enduring after 25 years of ignored social disapproval. Broken Lance is also beautifully shot in colour by Dmytryk, who captures the sun bursting through banks of cloud, riders’ reflections in murky creeks and dead trees writhing out of red earth superbly. Richard Matheson's well-worn post-apocalyptic science fiction novel I Am Legend (1954) will be familiar to modern cinemagoers from the 2007 blockbuster starring Will Smith and to an earlier generation who remember it as The Omega Man (1971) with Charlton Heston. However, the first filmed version was this shoestring Italian B production with Vincent Price as the titular loner. Matheson had scripted the first two of Roger Corman's Edgar Allan Poe features, The Fall Of The House Of Usher (1960) and The Pit & The Pendulum (1961) and would go on to write two more, Tales Of Terror (1963) and The Raven (1964), all of which were built around Price's hammy persona. 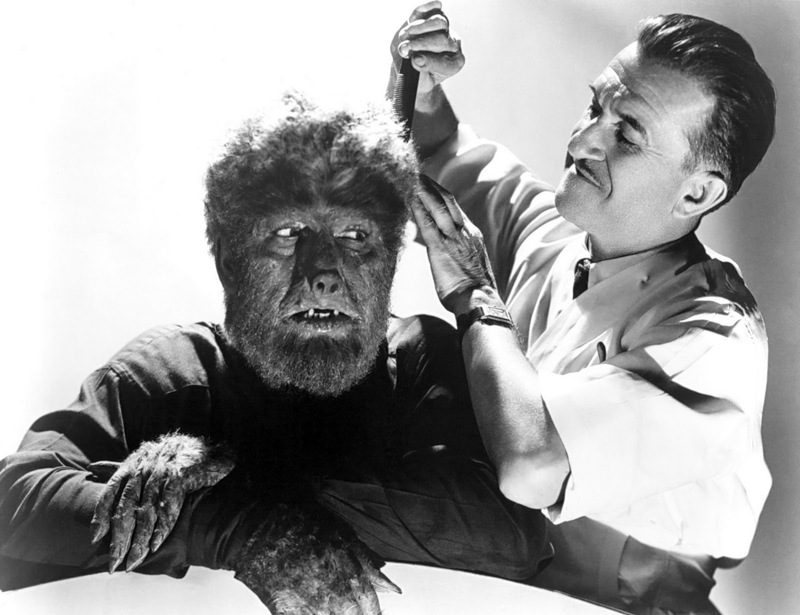 One of Tales Of Terror's producers was Samuel Z. Arkoff, the head of American International Pictures (AIP), who was impressed enough by Matheson to acquire the rights to I Am Legend in 1961 from fellow producer Robert L. Lippert, who in turn had picked it up for a song from legendary British horror studio Hammer. The ever accommodating Price again signed on to take the lead, the actor then working on a brace of low budget costumes dramas in Italy, Nefertiti, Queen Of The Nile and Rage Of The Buccaneers. AIP's resulting cheapo was shot in Rome to suit its star's schedule with an Italian director, Ubaldo Ragona, appointed to co-helm the project with American Sidney Salkow, whose role was to relay instructions to Price. Matheson himself helped shape the screenplay under the pseudonym "Logan Swanson" but apparently never cared for the finished item. A shame as the result is a memorably morose meditation on loneliness, the resilience of the human spirit and mob mentality that would serve as a key inspiration behind George A. Romero's groundbreaking zombie horror Night Of The Living Dead (1968) and looks forward to Cormac McCarthy's novel The Road (2006). Scientist Robert Morgan (Price) believes himself to be the last human being alive after the rest of the planet's population has been wiped out or turned into vampires by a mysterious airborne plague. 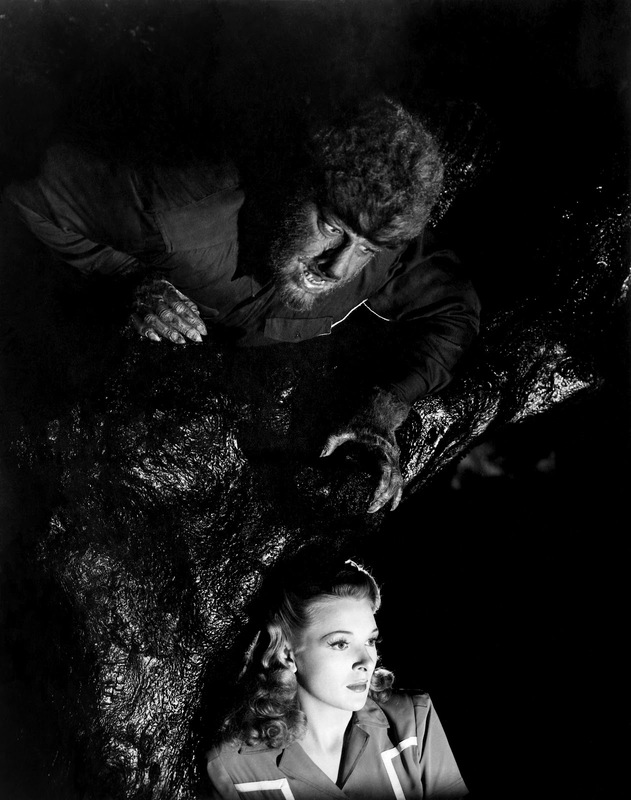 As Morgan has no one left to talk to, his depressed interior monologue provides the film's sole source of spoken narration. Morgan can't understand why he alone has been spared the awful fate of his peers and tortures himself each night by endlessly re-watching the same old footage of his late wife and daughter as the undead cadavers of former friends and colleagues gather outside to smash in his windows, bating and taunting him cruelly. The Last Man on Earth lives modestly in the same house he once occupied with his happy family, only now the windows are boarded up and the place has fallen into disrepair. He spends his time chalking off the days on a calendar scrawled on the wall, replenishing the garlic flowers tied to his front door, sending out distress signals via a shortwave radio, carving fresh stakes and sweeping the corpses off his driveway for incineration. Despite the infinite material possibilities that looting might offer, Morgan strives to obey the laws of a world that no longer exists and takes nothing more than he needs from its abandoned stores (which, for some reason, remain conveniently stocked with supplies of fresh garlic but we'll let that pass). Hope is all that Morgan has to live for but his redoubtable nature and self-sufficiency makes the character compelling. Price looks more wearied than usual (although he's still commendably clean-shaven) and instils Morgan with real poignancy, notably in the scene were his laughter descends into violent sobs at the memories evoked by a home movie or through the pathetic elation he displays at discovering a small black poodle alive and wandering the streets unharmed. When he eventually runs into Ruth (Franca Bettoai), apparently the Last Woman on Earth, his dreams of salvation are almost realised before being savagely pulled apart by mistrust and paranoia on both sides. The flawed, cultish "new society" of survivors she belongs to anticipates 28 Days Later (2002) and the emergence of its members prompts the film to lay down its final card as Morgan is chased and unceremoniously slain on a church altar. Once the monster was pursued by the masses seeking revenge: now the mob has become the monster. A bleak note to end a relentlessly grim and humourless work on, but, hey, this is the end of the world we're talking about here. 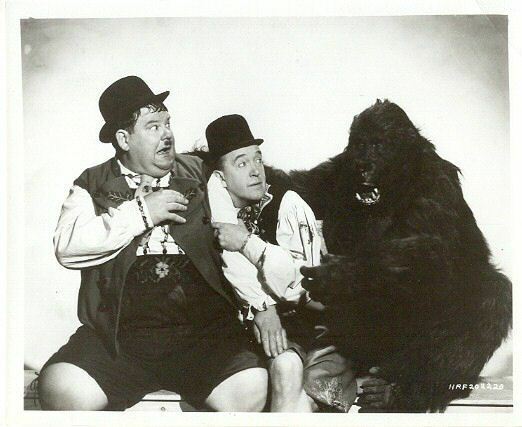 The closest Michael Balcon’s Ealing ever came to making a musical, this splendid period piece stars comedian Tommy Trinder (“You lucky people!”) and the great Stanley Holloway as rival lion comiques in the gas-lit music halls of mid-nineteenth century London. Trinder is Joe Saunders, a miner who comes to the capital to seek his fortune, finding work singing in a pub in Elephant and Castle where he impresses before being scouted and invited to play at The Mogador, a raucous watering hole. Saunders is roundly booed on his debut after trying to impress with a sentimental ballad preaching temperance but the venue’s brassy owner, Bessie Bellwood (Betty Warren), decides to give him another chance on the condition that he change his name and sing drinking songs more in keeping with the boozy atmosphere of the place. Adopting the stage moniker George Leybourne after his home town, the young man proves a roaring success. However, his burgeoning reputation catches the ear of The Great Vance (Holloway), London’s leading comic singer, who accuses Leybourne of stealing his act and orders him to cease and desist. Their rivalry grows as the pair compete with one another to sing the latest drinking song – ‘Ale, Old Ale’, ‘Gin, Gin, Gin’, ‘The Brandy & Selzer Boys’, ‘A Glass Of Sherry Wine’ - until the entire liquor cabinet has been exhausted and they resolve to settle their differences on the duelling field. Thereafter Leybourne and Vance reluctantly agree to end their arms race and join forces when the government forms a select committee to investigate the music halls as dens of depravity under pressure from the West End, whose theatres regard the popularity of working class variety shows as a threat. But don’t worry - this is the sort of cosy old chestnut where a last minute reprieve is granted following an unexpected change of heart from an influential official. 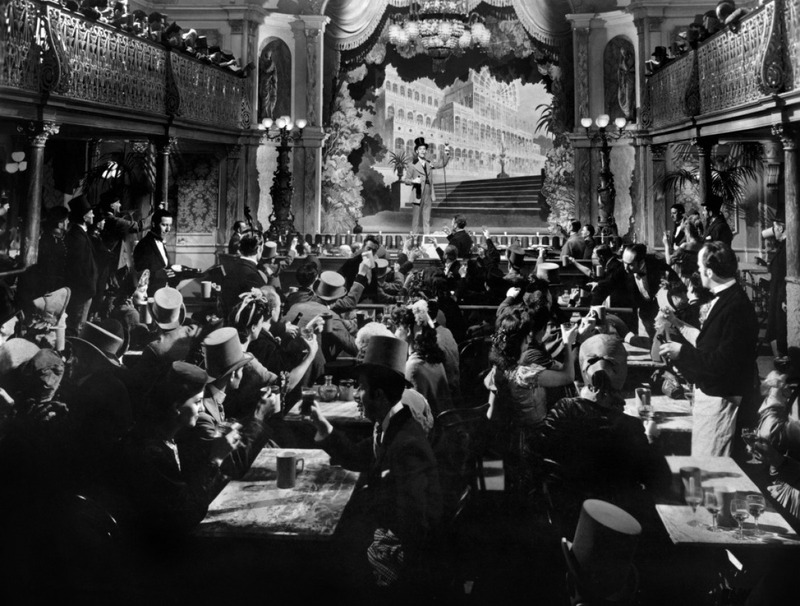 Trinder’s character is based on a real music hall performer of the 1860s of the same name, whose signature song gives Alberto Cavalcanti’s film its title. Leybourne is best remembered today for writing ‘The Daring Young Man On The Flying Trapeze’, a popular song about French acrobat Jules Léotard. Cavalcanti, a Brazilian set designer and documentarist who had worked in Paris before being invited to England in 1934, was appointed to direct Champagne Charlie by Ealing head Balcon on the understanding that he would bring his eye for social realism to the subject. Rather than the Dickensian squalor Balcon was expecting, Cavalcanti produced an escapist entertainment that chimed nicely with the public appetite for nostalgia in war time, a tribute to the popular stage that was well on its way to dying out. Pub sing-alongs had gained a new importance in the forties, serving as a means of lifting morale and expressing camaraderie against a common enemy over a few pints during the war. This is a point well illustrated in Terence Davies’ most recent film, The Deep Blue Sea (2011), in which a crowd of evacuees gather on the platform at Aldwych tube station during the Blitz to sing ‘Molly Malone’ defiantly as the bombs rain down above ground. Balcon would eventually get Cavalcanti to play ball, meanwhile, assigning him to direct an adaptation of Nicholas Nickleby in 1947. Perhaps closer to Christopher Nolan's The Prestige (2006) than Charlie Chaplin's Limelight (1952), the finest scene here is the spectacular mass brawl that erupts when a gang of paid agitators claim to be outraged by an openly socialist song performed by Leybourne, prompting the costumed turns and sozzled patrons to start swinging their firsts and tossing meat pies. Cavalcanti's camera roams the stalls, covering the action from any number of inventive angles and giving us a real feel for what it must have been like to find oneself inside a beery hovel like The Mogodar. 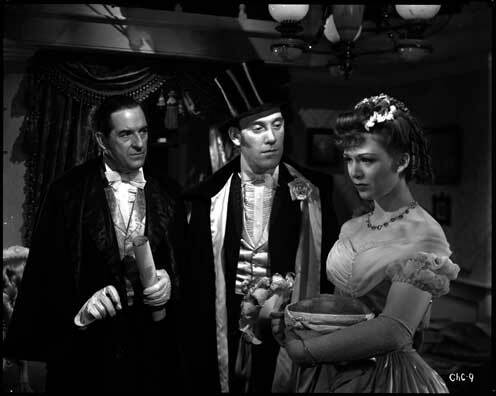 Trinder, Holloway and Warren make for an engaging trio and there’s handsome support from Jean Kent as a ballerina whose love for a lord looks set to be stifled by social snobbery. Look out too for Billy Shine and Harry Fowler, the young rogue from Hue & Cry (1947), as stage hands, Vida Hope as a barmaid, Guy Middleton as a “tipsy swell” and Eddie Philips playing to type as an East End boxer. Based on a play, the screenplay was written by John Dighton, Angus MacPhail and Austin Melford with Douglas Slocombe on camera duties. T.E.B. Clarke and the flamboyantly homosexual peer and aesthete Lord Berners, the sort of fellow to delight in dying pigeons pink, were among those contributing new song lyrics. Charlie Chaplin’s famous Juvenalian satire of Adolf Hitler is rightly remembered as a heroic piece of political rhetoric through which its creator dared to hold up the evils of Nazism and the Third Reich to the light of scrutiny, exposing their inherent absurdities at considerable personal risk. It is beloved for Chaplin’s iconic and elegantly choreographed ballet of the globe*, which owes something to James Gillray’s 1805 etching ‘The Plum-Pudding In Danger’, and for the stirring humanity of its closing speech, neither preachy Marxism nor trite sentiment and without doubt one of the finest ever composed by anyone anywhere. But for all The Great Dictator’s undeniable socio-historical importance, its powerful denunciation of fascism and anti-Semitism, the purity of its intentions and its influence for good at a pivotal moment in world history, it has to be said that, in purely cinematic terms, Chaplin’s intervention in the war is frankly a tad tedious. I realise this is a provocative statement to make but even the most staunch Chaplin fan must concede that, watched dispassionately over 60 years on from its original release at the height of the Blitz, the film is over-long and ultimately bows under the weight of its own worthiness. The Jewish ghetto scenes starring Chaplin’s wife Paulette Goddard and the impressive Maurice Moscovich in particular are well acted but intrude upon the humour of the palace episodes. It is hard to laugh at Adenoid Hynkel’s goatish lechery and mercurial temper once we have seen Goddard’s Hannah being pelted with tomatoes in the street or Chaplin’s amnesiac Jewish barber narrowly avoiding being hung from a lamp post by a mob of storm troopers. These surly individuals are also a reason for the failure of these sequences – they speak in reassuringly buffoonish Brooklyn accents and their brutality is cruel but does not come close to suggesting the violence and thuggery of what really went on. Of course, the film was made before the true horrors of Hitler’s political machine became known and attempting to dramatise their savagery any further would risk capsizing the comedy altogether. But some things just aren’t funny and for my money these interludes should have been done away with altogether or at least reined in. The Marx Brothers avoided making the same mistake with Duck Soup (1933), focusing their attentions solely on the ludicrous Wonderland politics of Freedonia, but Italian comic Roberto Benigni fell into the same trap with his woefully overrated Life Is Beautiful (1997) and the results were ghastly. However, I suppose these scenes do help to underline the human consequences of Hynkel’s orders, without which he might appear little more than a militarised clown, which would have blunted the message entirely. This point is perhaps best illustrated by Chaplin when he cuts between the barber and Hannah escaping from a burning building to Hynkel idly playing the piano like a latter day Nero. Without Chaplin’s barber character, the script, written by its star with assistance from young Marxist Dan James, would also lose its mistaken identity plotline, borrowed from Mark Twain’s The Prince & The Pauper (1881) by way of brother Sydney Chaplin’s King, Queen, Joker (1921), which would have required a rethink of the circumstances surrounding the final address. 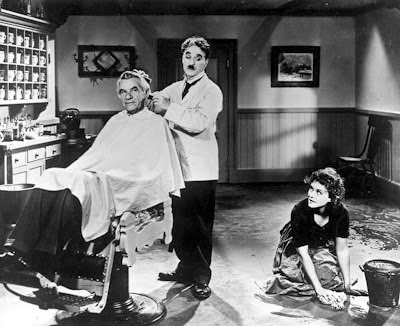 The barber, a veteran of the Great War, also makes for a pleasing throwback to the Little Tramp, the scenario recycled from a 1919 skit Chaplin had intended to include in Sunnyside, with perhaps a dash of W.C. Fields thrown in too. The palace scenes are much more successful, however. Hynkel is indeed a searing lampoon of the Führer, a creature supposedly born within the same week as Chaplin in mid-April 1889. Chaplin was said to be fascinated by the parallels between himself and the dictator, both knowing poverty in early life and sharing a love of Wagner, and once said to his son, “Just think, he’s the madman, I’m the comic. But it could have been the other way around.” British political magazine The Spectator compared the two men with the matching moustaches in 1939, arguing that, “Each in his own way, has expressed the ideas, sentiments, aspirations of the millions of struggling citizens ground between the upper and lower millstone of society... Each is a distorting mirror, the one for good and the other for untold evil”. 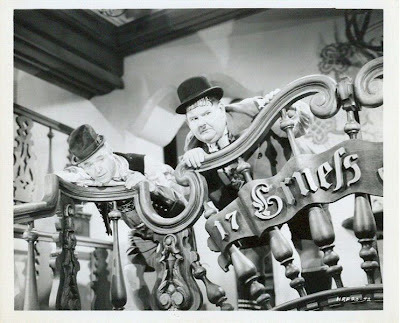 Adenoid Hynkel is less a “medieval maniac” than a monstrous overgrown child, irritable with his familiars, notably Herr Herring (Billy Gilbert), and competitive with his brash, domineering rival Napaloni (Jack Oakie). The latter injects some much needed energy into proceedings when he arrives in Tomainia for a state visit – his game of one-upmanship with Hynkel over a pair of raised barber's chairs a definite high point. However, the casting of Henry Daniell as Garbitsch, Hynkel’s Minister of the Interior, is a major misstep. Daniell delivers his lines with a steely absence of emotion, his coolly sinister presence as the power behind the throne suggesting a very real evil that again jars with much of the film’s broader humour relating to rants in macronic German, food fights, saluting and falling down stairs. It’s seeing the folly of these men exposed that’s funny, not the frightening realities of their sadistic megalomania. 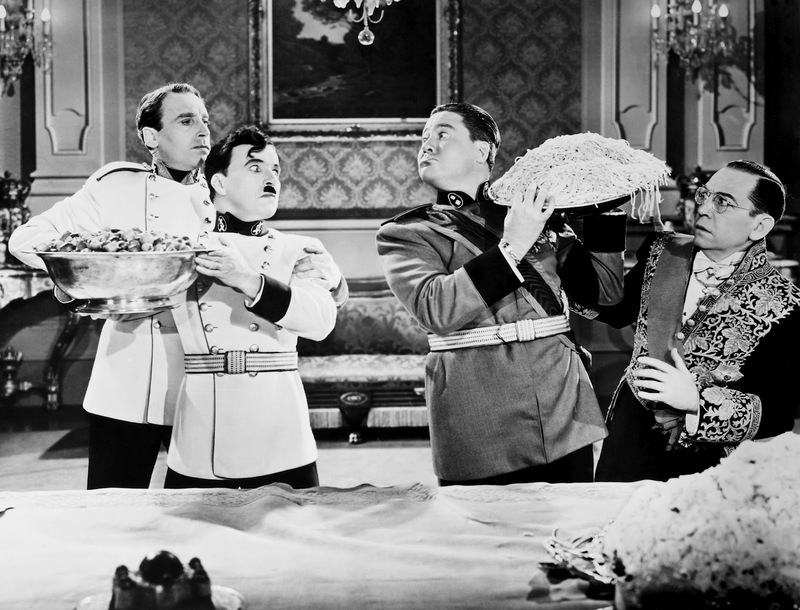 Jean Renoir commented upon the release of La Grande Illusion in 1937: "I don’t think cinema can have an impact on society and even less so history. But I do think cinema can influence people’s moral code". 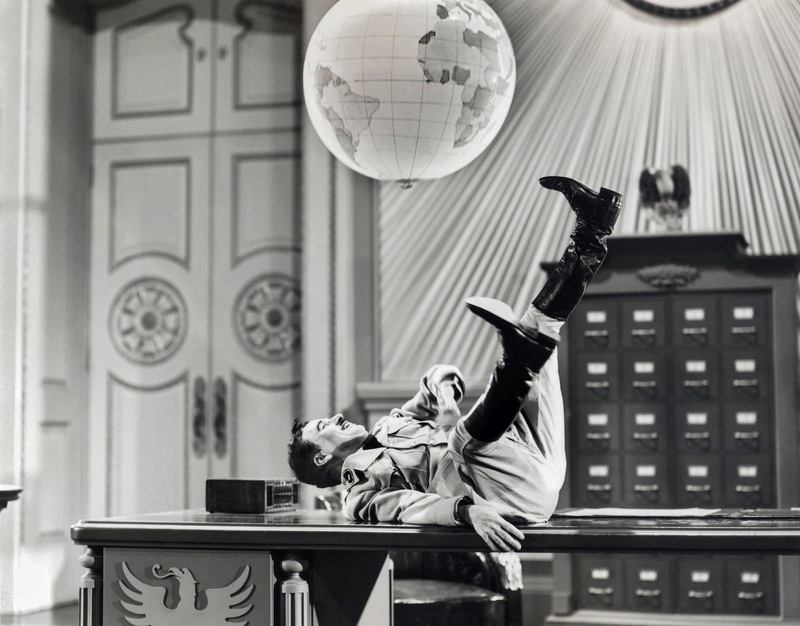 Despite my gripes, there can be no question that The Great Dictator deserves its immortality, for the above speech and its contribution to the allied cause if nothing else. I maintain that it asks too much of an audience emotionally, over reaches itself in attempting the impossible and is overall something of a mess, albeit one elevated by a few moments of genius. For all that, it's also a defiant raspberry to Leni Riefenstahl’s Triumph Of The Will (1935) and a work that dared to remind the world that ridicule is a powerful weapon. 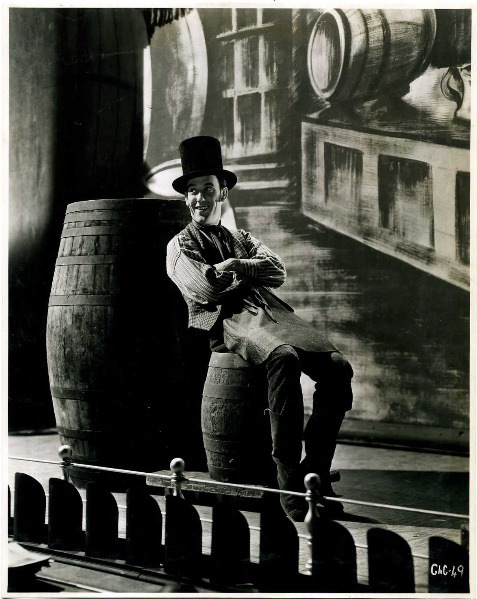 The Nazis considered Chaplin "a disgusting Jewish acrobat" (wrongly guessing his heritage) and doubtless would have had him executed had they won the war, while The Great Dictator also risked making matters worse for the Jews of Europe: neither consideration enough to prevent Chaplin completing a self-funded project he truly believed in, for which he is entitled to every credit. Its satirical legacy can still be seen today in films like In The Loop (2009), Four Lions (2010) and, perhaps most obviously, Sacha Baron Cohen’s The Dictator (2012). Comedy remains a serious business. *There's a nice tribute to this scene in the recent Finnish-German steampunk sci-fi oddity Iron Sky (2012). A Nazi schoolteacher living on the dark side of the moon (don't ask) shows the film to a class of Aryan school children and refers to it as one of the finest short films ever made, implying that The Great Dictator consists solely of the ballet of the globe and lasts just 10 minutes. Chaplin's film has obviously been heavily cut by Joseph Goebbels to create the illusion that it is pro-Hitler. The teacher only learns the truth when she visits earth and attends a screening of the film proper at a New York art house cinema. Her shocked reaction as she exits the theatre is priceless.